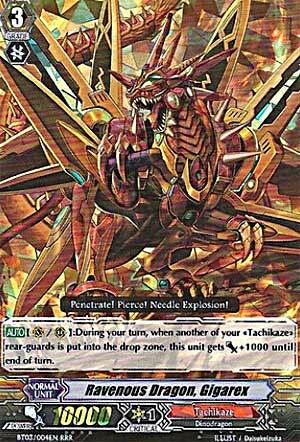 AUTO【V/R】: During your turn, when another of your «Tachikaze» rear-guards is put into the drop zone, this unit gets Power +1000 until end of turn. I feel like I'm in the twilight zone. In stark contrast to yesterday's card, today's is not only underpowered, but has never been worth a look, dedicated build or otherwise. Ravenous Dragon, Gigarex is an embarrassment to his RRR status. When one of your Tachikaze rear-guards is retired, Gigarex gains 1K until the end of the turn. And indeed, you can expect a Tachikaze deck to retire its own rear-guards. There's a limit to how many times they can feasibly do so without running out of counterblasts to mitigate any potential losses, though. The usual rate is once per turn, so chances are that Gigarex will have 11K. Cool, right? ...no. Without any boosters that exceed 8K, that power buff simply isn't enough to break any offensive barriers that it couldn't already with said 8K booster, and it'll take one additional retire to reach the 18K threshold with Tachikaze's multitude of 6K boosters. If you're a cool kid, you can pair it with the 8K booster with those same two retires against a 10K Vanguard. Of course, you'd run out of offensive steam way before that 10K Vanguard runs out of defensive options anyway, lest ye feel like losing cards for no reason. We live in a time where almost every clan has access to grade 3s that can easily, effortlessly, and usually without cost reach 12000 or higher when attacking. So, why does Gigarex even exist? He gains 1000 power for the rest of the turn whenever one of your Tachikaze rear guards is sent to the drop zone. Yes, this is something that Tachikaze does, it's pretty much their entire gimmick. But it's something that is done strategically and sparsely, little by little over the entire game as they pay for abilities conserve their card advantage through various skills and such. In other words, Gigarex will realistically only gain an extra 1000 on any given turn where your rear guards are sent to the drop zone, maybe an extra 2000, and even that isn't guaranteed to happen every single turn. These aren't numbers that are worth the space Gigarex takes up. This makes Gigarex essentially a 10000 vanilla who is sometimes 11000 but not consistently. Sounds amazing, right? And sadly, it's pretty much the best Tachikaze even has right now, because every other grade 3 they have is even worse except for Tyrant, Deathrex, who is a vanguard, not a rear guard. The one advantage that Gigarex has is that, since he swings for 11000 often enough, he is a pretty good stand target, which is fairly important as Tachikaze are forced to run stands right now. Oh my, so today we have been blessed with the lovely Gigarex. Gigarex is a relatively... well its not very good. It's ability does follow the Tachikaze ways, but it really doesn't have a lot going for it. That +1000 is rather abysmal. However I will say it does have its small uses, seeing as Deathrex retires a unit everytime it lands an attack then you have to retire a rearguard, this means your Gigarex is getting that +1000 regardless, and seeing as you can probably boost it for 7000, you have yourself something that can at least generate an 18000 column and force that 10k shield from a Crossride. I suppose I shouldn't be too negative, considering this effect can be used in the rearguard that is rather helpful seeing as 11k rearguards are handy. I really don't have a heck of a lot to say about Gigarex, it has a fairly basic effect in a clan that gains power and such from retiring other units. So I'm actually going to have to give this guy a 3/5.